Vacation season is in full swing, which includes visiting friends and family; seeing new places; and, most likely, doing a fair amount of eating out. For me, it has meant eating some things I was hard pressed to recognize and indulging in my current favorite dessert – lemon drizzle cake. To wipe some of those hard to recognize meals out of my mind, I think a little Random Word Improv is in order. Whether you met your writing goals this week, spent your time dealing with daily life, or just took some time to relax and recharge, a few minutes of improv are a great way to have a little fun and get some words on the page. 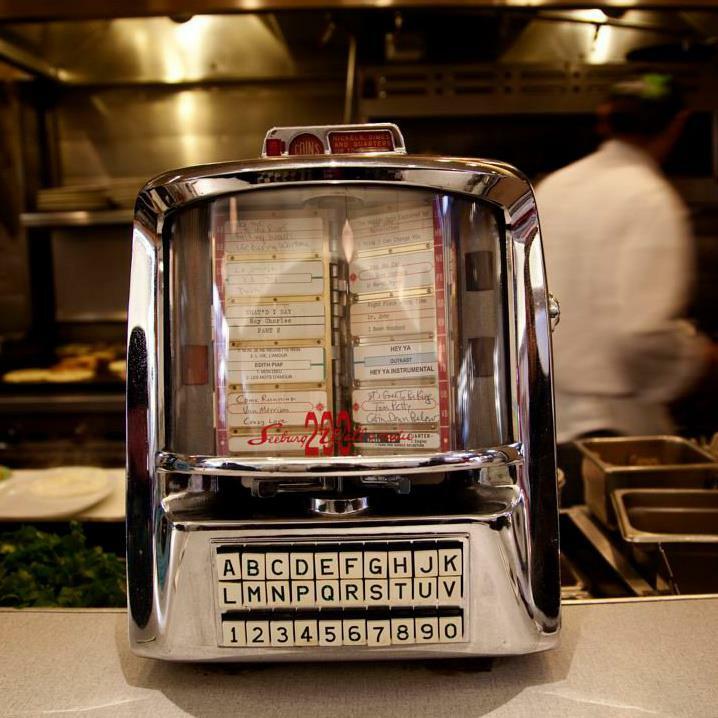 I don’t have a jukebox like the one in the picture above, but I’ll queue up some music on my iPod to get me in the writing mood. Feel free to queue up a motivational sound-track of your own. All right, let’s get started. As you might have guessed from the title of this post, we have a theme today, inspired by my favorite brunch spot, though you are free to ignore it. Here are our specially selected random words. Can’t wait to see what you do with them. This entry was posted in Writing Sprints and tagged Elizabeth Eldridge, fiction writing, flash fiction, Random Word Improv, short stories, writing motivation, writing sprints. Bookmark the permalink. Oh my god! I am far too late to do this, but what a great list! I had some very good lemonades while I was travelling, and ate at some very fine bars and grills. (What is the plural for that, anyway?) I’m hardpressed to decide what was the best — the Italian-style chicken schnitzel salad with feta and dark greens (my daughter and I split it! What fun to discover we can split stuff! ), or maybe my daughter’s excellent fish and chips that we had in the Denver airport. These words will definitely be bouncing around my head when I take a look at your new writing sprint later today!